With GIS, DHS supplies geospatial data, services, and applications to the homeland security community. DHS OneView, a viewer that addresses homeland security issues, is built on top of ArcGIS API for Silverlight. The Geospatial Information Infrastructure services are hosted in a virtualized environment running ArcGIS for Server. There are a few instances where television gets it right. Whether it’s Homeland or the now defunct 24, the hit shows delve deep into fantastical faux-real-life adventures where government agents work at a fever’s pitch to protect people—and the nation—from enemies both foreign and domestic. While the plots and technologies often require the requisite “suspension of disbelief,” the one area consistent—and grounded in reality—with these shows is the use of information as the asset for investigation and protection. It’s where truth and reality meet. Real homeland security and law enforcement agencies comb through mountains of data to piece together clues for catching criminals. The key hurdle for the 21st century isn’t collecting the data—it’s making it easily understood and accessible. By using location as a common denominator between disparate datasets, users can connect the dots in a meaningful way that drives more informed decision making and more targeted and forward-leaning response. 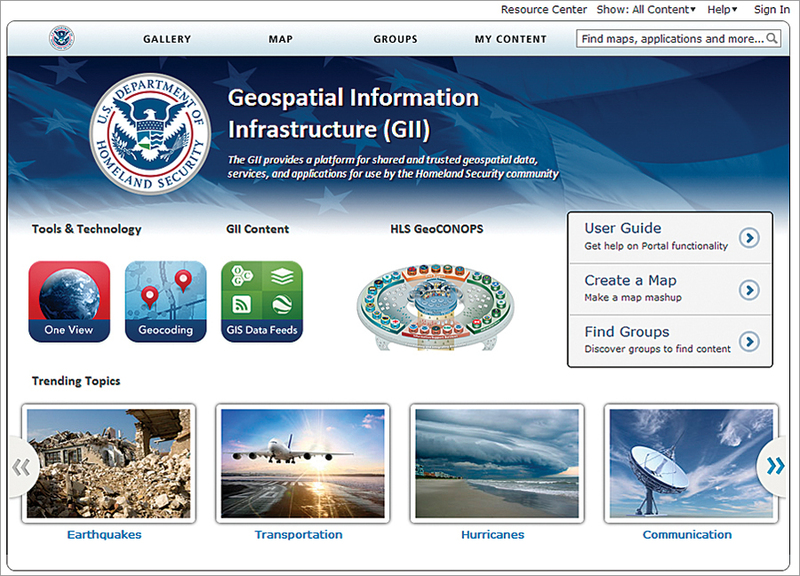 The GII Platform, which is based on Portal for ArcGIS, supplies shared and trusted geospatial data, services, and applications for use by the homeland security community. The US Department of Homeland Security (DHS) Geospatial Management Office (GMO) has designed and deployed a truly remarkable enterprise system—the Geospatial Information Infrastructure (GII)—that just might seem like the stuff of television. The GMO was established to advance the use of geospatial technology across the DHS enterprise to promote geospatial tradecraft in support of DHS operations, promulgate geospatial standards, and implement a geospatial data strategy that enables individual DHS geospatial program offices and empowers frontline operations with location-based tools. The GII is a critical, common component that supplies geospatial data and application services to the diverse suite of DHS missions encompassing law enforcement, border protection, emergency management, critical infrastructure protection, and national operations and data fusion centers. The GII is a consumer-driven geospatial enterprise resource that is built based on mission needs and operational requirements that are aligned to the Homeland Security Geospatial Concept of Operations (GeoCONOPS) and informed by national geospatial policy and doctrine. GII currently supports the 200,000 DHS employees and 50,000 DHS contractors, plus homeland security partners within the state, local, tribal, and territorial communities. What makes the system so unique is it provides fast, efficient access to Sensitive but Unclassified (SBU) or Controlled Unclassified Information (CUI) data. Agencies across the country have access to valuable information for a wide range of mission-critical needs. The Department of the Interior’s geospatial information officer, Jerry Johnston, took the lead on developing a public-facing geospatial solution that could provide maps and data to anyone. Alexander and Dan Cotter, DHS’s geospatial information officer, reached out to Johnston to discuss how they could collectively work on this government geospatial transformation. The initial collaboration involved integrating GeoPlatform.gov into the DHS GeoCONOPS as the public platform for all DHS data. The GII was then identified as the platform for managing and distributing SBU or CUI geospatial information. Since then, the two teams have worked collectively toward a common goal of improving access to geospatial maps and data services, regardless of the data classification and security. SBU is unclassified information that is simply too sensitive to make public. This is the arena in which most first responders, emergency managers, and homeland security professionals work. One of the key attributes that make the GII such a unique and powerful platform is it serves all 22 DHS components, including the Federal Emergency Management Agency (FEMA), the US Coast Guard, the United States Secret Service, Customs and Border Protection, Immigration and Customs Enforcement, and the Transportation Security Administration. In addition, all state emergency response centers, state fusion centers, local emergency managers, and other state and local agencies have access. The GII capabilities and services are used at all levels of government. The power of enterprise access means decisions are improved by being able to obtain the information in a much quicker time frame. And analysis is bolstered. People can analyze natural disasters and technological hazards and assess critical risks, such as population, infrastructure, or natural resources. Critical infrastructure and cultural centers can be identified and protected against potential threats. GII analysis and maps also help with special event planning (Republican and Democratic National Conventions; the Presidential State of the Union address), illegal border activity, search and rescue operations, continuity planning, and more. Virtually every DHS mission has some touch point with natural disasters and terrorism threats for the continuity of operations or as emergency support functions to national response scenarios. The FEMA GeoPortal was established using shared services from the GII and GeoPlatform.gov—in advance of 2012’s Hurricane Isaac and Superstorm Sandy to provide quick access to data from disaster response and recovery operations and give the community access to near real-time data to inform its action plans. The enterprise geospatial capabilities are transforming how DHS provides situational awareness and shares information with support organizations and citizens. Geospatial Discovery Platform (GII Platform)—The GII Platform, which is based on Portal for ArcGIS, supplies shared and trusted geospatial data, services, and applications for use by the homeland security community through the SBU Homeland Security Information Network (HSIN). The platform enables authoritative real-time data exchange. The GII team actively collaborates with the Federal Geospatial Platform team that manages GeoPlatform.gov, the unclassified public platform that provides the same data discovery capabilities. Turnkey Map Viewer (DHS OneView)—The GMO invested in developing an intuitive viewer—called DHS OneView—that is tailor-made to address homeland security issues. OneView is a web-based mapping application that delivers visualization capabilities for GII. The viewer is built on top of ArcGIS API for Silverlight and has been identified by the DHS CIO as the standard common operating picture for all DHS components. Hosted Content Delivery Services (GII Services)—The GII provides more than 400 hosted geospatial web services for the homeland security community to consume. The hosted web services contain important DHS datasets, as well as key national infrastructure data, including the Homeland Security Infrastructure Program. Through the GII, DHS provides access to these critical hosted services to state, local, tribal, and territorial homeland security systems, including those in Oregon, Idaho, and Virginia. The GII services are hosted in a virtualized environment running ArcGIS for Server. Geospatial Enablement of Enterprise SharePoint (HSIN)—The GII is embedded into the HSIN enterprise SharePoint environment, which is based on Esri Maps for SharePoint. Each community of interest, of which there are 68 today, has the ability to include a mapping component as part of its SharePoint community that supplies access to the full set of GII data services. The environment currently supports 46,000 federal, state, local, tribal, and territorial homeland security professionals. The DHS GMO’s future road map for the GII involves expanding DHS geospatial content holdings available to the community. This expansion will provide mobile applications and hosting services, federate catalog services between the GII and GeoPlatform, and lead efforts to streamline geospatial data discovery and access. This can be accomplished by encouraging registration of publicly available data to the Federal GeoPlatform and SBU-level data registration to the GII and advancing a “no wrong door access policy” through the implementation of Global Federated Identity Management exchanges across the geospatial community. For more information, contact Bill McGilvery, Esri.